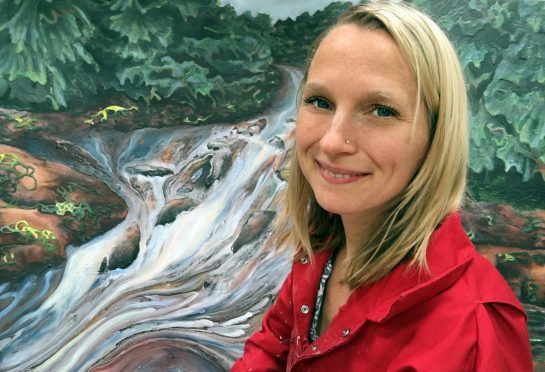 Artist Lisa Shaw loves exploring the banks of the River Findhorn with her two sons. An innovative painting technique has been used to capture one of Moray’s most beautiful but ferocious natural features. Artist Lisa Shaw has recreated the ebbs and flows of the River Findhorn using a method known as “flow casting”. To mimic the direction of the river the Findhorn-based artist poured runny paint onto a canvas before tilting it to create movement. Pockets of clay resembling rocks were strategically placed to guide the bright colours around obstacles in the way that the water does on its way to the bay. The results are now being displayed in a new exhibition running at Elgin Museum. The river is one of the artist’s favourite features of the region she has called home for 11 years after moving from New York. The 35-year-old regularly goes on adventures along the banks of the water with her two young sons Jasper, four, and one-year-old Griffin. And the flow of the water is a constant source of inspiration for her in life as she “goes with the flow”. She said: “I love to go there with my family. It’s one of our favourite places to go. “My boys love to go there to camp. We’ve been there many times – they love the big trees and enjoy exploring. We have gone canoeing in it too down certain parts. “The colours along the river are amazing and I love to watch the flow of the water. Mrs Shaw used bright colours to recreate the eddies of the river by tipping the canvas on its side. Rocks were later added used fine brushstrokes. Three pieces in the exhibition did not have their inspiration drawn directly from the Findhorn – instead being modelled on the physics of water movement. The Flow Path exhibition is on display at Elgin Museum until Saturday, August 26.